Its grateful accepting with thanks for the gadgets and devices getting all the sources from solar energy as we are in need to develop such technology which is required very much now days, perhaps in all department of technology green movement getting into its groove, and among so many gadgets manufactured utilizing the solar energy, here is an solar-powered Bluetooth headset, the headset equipped with built-in solar charging panel and bundled with USB charging cable as well. 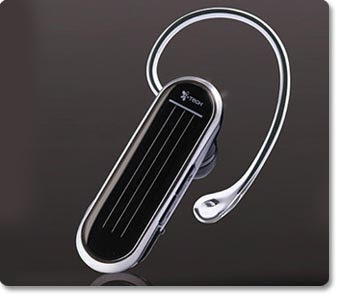 Hong Kong based mobile telecommunications accessories manufacturer i.Tech Dynamic, a subsidiary of Hutchison Harbour Ring, has launched SolarVoice 908, a Bluetooth headset which i.Tech says is the first solar powered headset featuring noise reduction clear calls. Solar Power or USB Charging via PC/Mac, notebook, AC power etc. The most convenient way to charge up the Headset using the unlimited Solar energy! Infinite Standby time under Sunlight! It supports Multiple Pairing that Each Headset connects up to 2 Bluetooth mobiles/devices at a time! • Charged by USB: bundled with Usb charging cable, which can be charged by your Desktop(PC/Mac), Laptop or AC Adapter.